Massena LAB is a creative laboratory created by William Massena, an industry veteran, long time collector and General Manager of Time Zone, the oldest and one of the most important watch related forums on the net. The philosophy of Massena LAB is to collaborate with independent watchmakers to create watches of sophisticated character with enduring value. Even though Massena had worked with Habring² in the past, the Erwin LAB1 is the very first collaboration under the Massena LAB umbrella. Habring² is created by multiple Grand Prix d’Horlogerie de Geneve (GPHG) award winner, husband and wife team of watchmakers Richard and Maria Habring, who after having worked for different brands set up their workshops in Austria in 2004 concentrating on making timepieces with features and complications rarely found in the market and at an affordable price point. 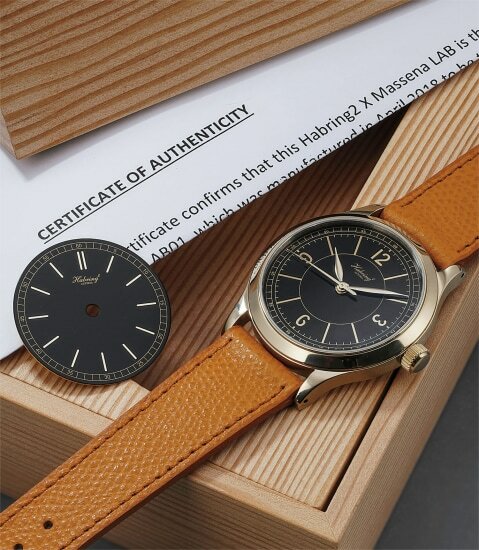 The Erwin LAB01 was definitely a watch collectors had been hoping for, it was presented early 2019 as a limited edition of 50 pieces and it sold out within a matter of days! The movement is developed fully in house by Habring² and features a dead beat seconds mechanism meaning a seconds hand that advances perfectly once every second. Housing the movement is a surprising polished bronze “Calatrava” style case closer in color to vintage yellow gold than to the matte bronze we are more used to seeing. The black glossy dial with gilt printing is an homage to the gorgeous sector dials found in some of the most beautiful watches in the 1930s. The present Erwin LAB01 is the original prototype that was later brought to the market and is also offered with a second prototype dial that never made it into production. The case is different to the production model as the flank was brushed as to test the aging process of the bronze case. An appealing watch in its own right the present model is both historically important as it is the prototype of the very first Massena LAB timepiece. In an extremely generous gesture by the consignor, all proceeds from the sale of this watch will be going to the United Nations High Commissioner For Refugees.